Perhaps it came from watching the Odessa Steps sequence, projected in hazy 8mm, on the bedroom wall during my teenage years. Or maybe it was seeing my first Bruce Lee movie in the early 1970s. In any case, at some point I became a connoisseur of action sequences. Eventually I was able to indulge this tendency by writing about Eisenstein, but also by studying Asian action film. So it was with a definite sadness that I watched, from the 1980s onward, the tendency of American filmmakers to give up on rendering physical movement with full force. Action sequences became jumbled arrays of short shots and bumpy framings. The clarity and grace of motion seen in classic Westerns and comedies, in the work of Keaton and Lloyd and Ford and Don Siegel and Anthony Mann, gave way to spasmodic fights and geographically challenged chases. At first, the chief perpetrators were Roger Spottiswoode and Michael Bay. Now it’s nearly everybody, and journalistic critics have recognized that this lumpy style has become the norm, even in the generally admired Bourne entries. Classic Hong Kong and Japanese action scenes were “expressionistic” in the sense that their larger-than-life balletics and aerobatics amplified recognizable (if extreme) possibilities of the human body. The result was a carnal cinema, in which shooting and cutting aimed to enlarge and prolong graceful movement. By contrast, Hollywood action scenes became “impressionistic,” rendering a combat or pursuit as a blurred confusion. We got a flurry of cuts calibrated not in relation to each other or to the action, but instead suggesting a vast busyness. Here camerawork and editing didn’t serve the specificity of the action but overwhelmed, even buried it. Why is the filmmaker reluctant to face the concrete, moment-by-moment facts of the fight? Maybe it’s fear of censorship, or maybe it’s just lack of interest in physical processes. By contrast, most of the great Hong Kong action directors have been themselves martial artists. To them a fight is a suite of tangible actions and micro-actions. Or maybe the new muddier approach seeks to hide the fact that the action is preposterous. Western audiences don’t like far-fetched action that isn’t comic, but the new action picture is touted as a return to realism. Bond is tough and Jason Bourne’s adventures are “gritty.” Yet realism comes at a price, in this case the loss of bodily movements elegant in their efficiency. Defenders of the impressionistic approach say that it renders “what the action feels like.” But that would entail that the action feels fast and confusing. To whom? Maybe to a duffer like me, if I were dropped into the melee, but not to trained fighters. Bourne isn’t confused: his senses are alert, and his gestures are economical and smooth. So why render the scene as chaotic and show his gestures in jerky cuts? Any fighter overcome by the sensory overload handed to us would lose big. The classic Asian approach also tries to make us experience how the action feels, but it starts by taking pains to show how it looks. Hong Kong filmmakers constructed a sequence on a firm foundation, and that meant making each shot impossible to misunderstand. They then built those crisp images into what I called the pause/ burst/ pause structure. This simple pattern, capable of great variation. creates a staccato exhilaration. How? Here’s a first approximation. The stylistic orchestration of the fight trips off optical, auditory, and muscular responses in our bodies, while the pauses give the movement a chance to echo. Instead of a vague busyness, a sense that something really frantic but imprecise is happening, we get a marked rhythm alternating an exact visceral impact with tingling aftereffects. Eisenstein believed that when we see an expressive movement, we reflexively repeat that movement, albeit in weakened form. After one of these sequences you feel tired, but in a good way. We’ve been given a taste of what physical mastery feels like. Compare the action scenes of the first Transporter film (2002) with those of Transporter 3 of this year. 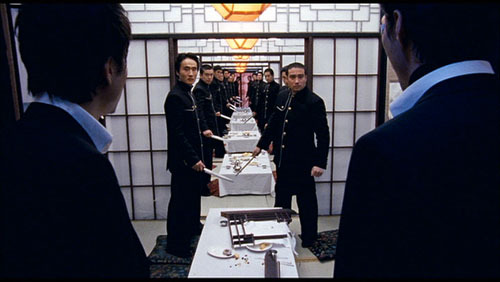 The first, directed by Hong Kong veteran Yuen Kwai (aka Corey Yuen), isn’t a patch on his best home-ground work (Ninja in the Dragon’s Den, Righting Wrongs, Yes, Madam!, Saviour of the Soul), but the bigger budget provided by Luc Besson gave him a chance to put Jason Statham through some energetic paces, particularly on the oil-slicked floor of a bus garage. 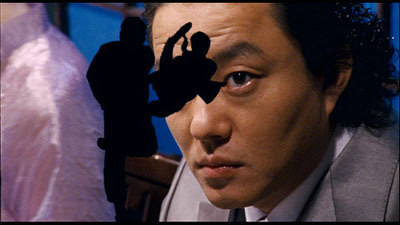 Yuen, a director who sacrifices even dialogue to pictorial rhythm, is fond of percussive insert shots (e.g., the garage scene’s crackling close-ups of Statham snapping bike pedals onto his shoes) and steep, tight angles that spread all of a fight’s players into a diagrammatic composition. But Transporter 3, choreographed but not directed by Yuen, has buried precise, bone-whacking action under freeze-frames, superimpositions, ramping, color shifts, and other Tony Scott doodling. Something more sober but just as nerveless is at work in Quantum of Solace. Here the jabbing handheld work of the Bourne pictures has been replaced by steadier framing and smoother traveling shots, but the hyperkinetic, what-did-I-just-see cutting is still there. Again, I think that the filmmakers are worried about the implausibility of the action scenes and so muffles them by a haphazard handling. Most discouraging has been the way that many Asian filmmakers have taken up the Hollywood approach. Today’s standard Hong Kong action picture is likely to be as visually and kinetically disorganized as the Hollywood product. That’s why I can recommend, as a palate-cleanser if nothing else, Ryoo Sung-wan’s City of Violence (2006), a Korean film recently made available on DVD from Dragon Dynasty. It is unapologetically formulaic. Pals in a teenage gang grow up to be gangsters and cops. Our protagonist, a big-city cop, returns to the hometown to discover that the weakest of the old crew has become a sadistic overlord. 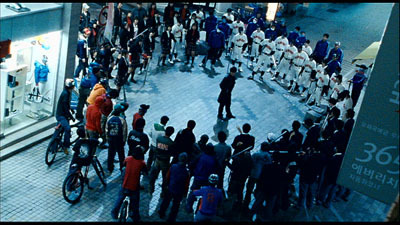 Fights ensue, culminating in a twenty-minute battle in which the hero and another schoolmate penetrate a restaurant where the villain is celebrating his new status. Thrashing their way through a crowded courtyard, then through a narrow tunnel of dining rooms, and finally into a two-story banquet hall, our heroes confront increasingly skilful fighters and eventually face off against their boyhood friend. Ryoo keeps the action scenes fairly brisk and inventive. The most impressive early one shows the hero surrounded by a battalion of young thugs in a nighttime boulevard. The teens, in an obvious bow to The Warriors, come dressed in ingenious uniforms and display alarming skills with hockey sticks and baseball bats. 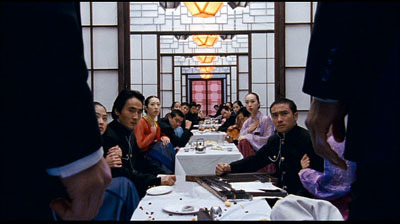 As in Hong Kong films, judicious long shots keep us oriented to phases of the action. 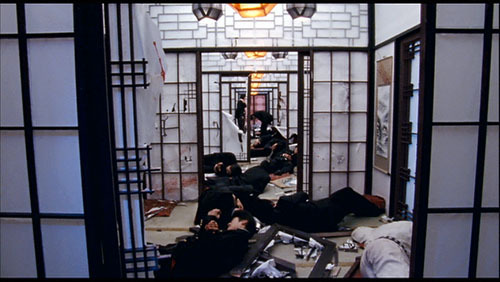 Borrowing unashamedly from John Woo’s Better Tomorrow series and countless Japanese swordplay films, City of Violence shows flashes of pictorial wit. The cop and his pal realize they’re confronting a platoon of bodyguards at supper when doors slide open to reveal a tunnel-vision perspective of fighters, blobs of black broken rhythmically by women’s pastel outfits. The film flaunts vivid color and icy focus in a way that much more expensive Hollywood genre movies, with their brackish palettes and soft edges, mostly avoid. (The realism alibi, again.) Even Ryoo’s use of CGI is playfully pretty, in a way that Casino Royale could be only in its credits sequence. Here the gang lord realizes his old pals are approaching. I don’t want to oversell this film, but it does show that the classic Asian tradition has not expired. Running under ninety minutes without credits, City of Violence aims at nothing more than telling a familiar story with vigor—along the way making us gape and flinch. In a good way. For arguments about Eisenstein and expressive movement, see my Cinema of Eisenstein, new ed. (Routledge, 2005). The case for Japanese and Hong Kong action films is made in Chapters 12-15 of Poetics of Cinema, and the pause/ burst/ pause pattern is analyzed in Chapter 8 of Planet Hong Kong: Popular Cinema and the Art of Entertainment. There, among other things, I try to give Yuen Kwai his due. This entry was posted on Sunday | December 28, 2008 at 5:05 pm	and is filed under Asian cinema, Film comments, Film technique, Film technique: Staging, Hollywood: Artistic traditions, National cinemas: Hong Kong, National cinemas: South Korea, Special effects and CGI. Responses are currently closed, but you can trackback from your own site.